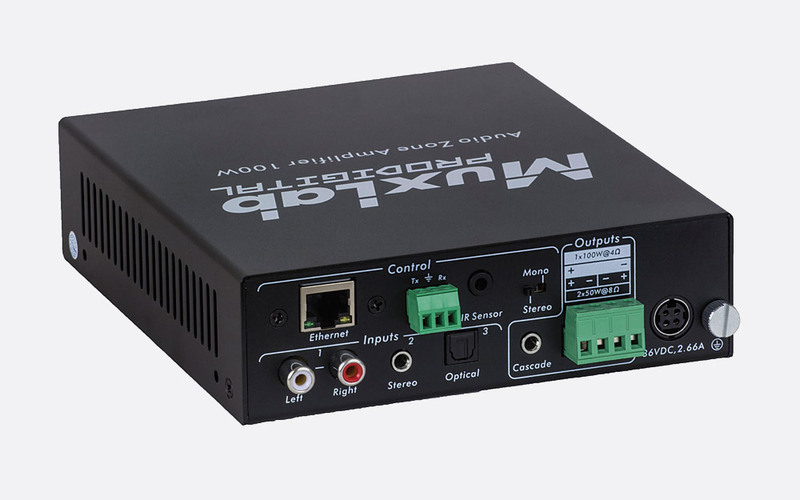 Muxlab audio amplifiers have been designed for use in meeting rooms, classrooms, and hospitality applications. Manufactured from metal, these amplifiers may offer the user a convenient option for installation or shelf mounted systems. This is a compact, Class-D power amplifier, capable of delivering 1x 40W into 8 ohms in bridged mode or 2x 20W into 4 ohms. The 500216 can be used stand-alone in smaller PA and background music systems, or cascaded to form larger commercial audio systems. It accepts one balanced microphone input via a 3-pole screw-terminal connector with switched 48V phantom power available, one line-level input via L/R RCA (phono) sockets and a 'Slave' input via 3.5mm stereo jack socket. A slide-switch is used to activate 48V phantom powering and select microphone or line level inputs. Loudspeaker output is via screw terminals. A 'Cascade' output is available via 3.5mm stereo socket for onward connection to additional 'Slave' units or third party electronics. Local control of the output level, mute and EQ settings is via push buttons. Remote control is provided via optional IR remote kit or RS232. Dimensions: 123 x 87 x 38 (WxHxD) mm. Weight: 0.45Kg. 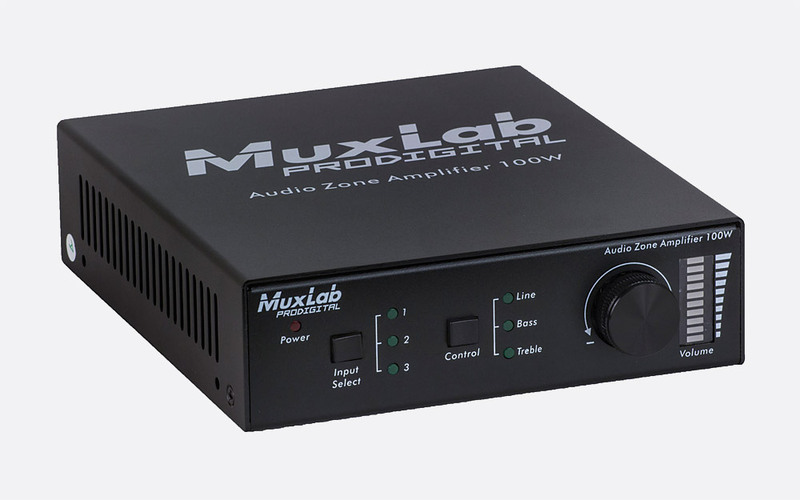 Note: The Muxlab 500216 amplifier does not provide any mixing capability. This Class D amplifier is the 'bigger brother' of the MuxLab 500216, offering 1x 100W into 4 ohms in bridged mode, or 2x 50W into 8 ohms. When paired with the 500755-70V, the system is capable of distributing power to 70V line audio systems over longer distances. Volume, mute, bass and treble can be adjusted via two switches and a single rotary control on the front panel - all of which can also be controlled remotely via RS232, IR or an IP based web server interface via RJ45 connection. The rear of the unit has all I/O connectivity with audio inputs offered via dual RCA (phono) sockets, 3.5mm jack socket, and optical TosLink connectors. Audio output is via a 4-pin terminal block with a single 3.5mm jack socket for cascade output. Dimensions: 148 x 44 x 165 (WxHxD) mm. Weight: 0.72Kg.